Mattis our honey apricot male pictured as a puppy. Ivanka our brindle girl pictured as a puppy. Please be aware that if you want to be considered for one of our future puppies you must fill out our puppy application. You can access the questionnaire on the Puppy Application/Contact Us page. Copy/paste and email the information to us so that we may review your application. Once we receive/review your application we will promptly let you know if you are a suitable candidate for one of our puppies. We only want the best homes for them. We want to know as much about the future buyer as possible to make sure that our puppies are going to responsible forever homes. Upon application approval, deposits may be placed at one to two weeks of age. ​Each puppy is individually priced accordingly. Puppies can go to their new homes at 9 weeks, this is very important as they learn so much in those weeks building up to that from their siblings and Mother. A $500 non-refundable deposit is required to hold any puppy. This is a serious commitment that should never be considered lightly or on a whim because you see an adorable puppy. This breed needs buyers to do tons of research, they are not for inexperienced owners or owners who have not educated themselves on the breed. They are expensive to buy, to care for, to feed etc. The vet care is more because they weigh so much, hence the medicine dosage will be more costly. 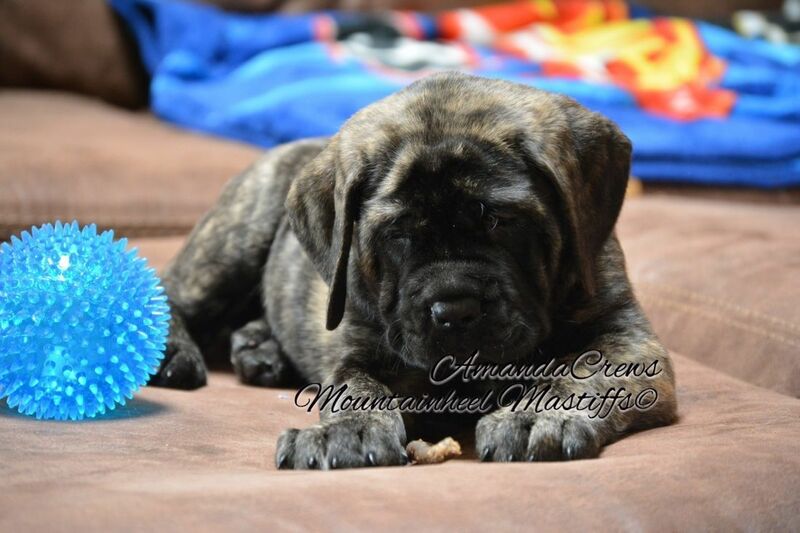 So many things to consider before taking on a Mastiff puppy. If you have done all of this, great. I hope all of my future puppies are put into the very best homes as a family member, No exceptions! I will be thorough and particular as to whom and where I place my babies. Deposits are placed in order received. Once deposits are received and recorded choices are made in chronological order. Unfortunately, per our written policy we are unable to hold any puppy without a deposit. If we do not receive a signed contract and deposit after 5 business days, we move on to the next person on the waiting list. We simply can not hold any puppy without a deposit. We ask that you send your deposit in the form of a cashiers check priority mail to get to us promptly. Breeder reserves the right to terminate contract for any reason, at any time prior to pickup of puppy, with a full refund of deposit and purchase price to buyer. paid in a timely manner prior to puppy leaving. IF puppy has to be shipped, full payment must be made ten days prior to puppy being shipped! ​Please note if you are close enough to visit, we can not allow visitors before puppies are a certain age, as we do not want to expose puppies to any outside diseases that can be brought into our environment by guests. The puppies health and well being is our number one priority. Prices will vary on individual puppies. Show/Breeder puppies will be higher than pet quality puppies. Puppies will be rated and priced accordingly. If a puppy you like is Show Quality and you only want a puppy for pet, the puppy price doesn't change. Contingent upon my approval on Full AKC Rights, I will NOT sell Full AKC to just anyone. You Must be a Responsible Mastiff Breeder, Breeder of Merit or someone that I personally know and trust. NO exceptions! I will not tolerate any backyard breeder inquiries. Do Not waste my time because I do thorough research to make sure my puppies go to excellent homes. We are willing to drive to meet you within a reasonable distance, to get your puppy to you. We delivered each puppy from our first litter to many different locations. It worked out great and none of our babies had to be shipped via airline. You may fly into RDU to meet us with your puppy and fly back to your destination with your puppy as carry on if you are able to do so. Last resort, we will ship Delta Dash if need be, just be aware of the extra expense/fees associated with shipping a heavy puppy which includes- Vet exam, health certificate, airline crate, and the airline ticket. I have had puppies shipped to me with no issues. Ivanka was shipped to us from Detroit, Michigan when we lived in El Paso, Texas and she arrived perfectly. Below is a picture of Mattis and his children that he loves deeply.